Neon lights are one of the most iconic symbols of the old Hong Kong, now mostly replaced by electronic displays or huge screens. With most traditional NEON light manufacturers on the brink of extinction, our team wanted to bring back tradition to our electronic times, reshaping our logo to resemble the repeating patterns and impulsive glow of the sometimes 15 meter tall NEON artworks hooked on gritty building walls. 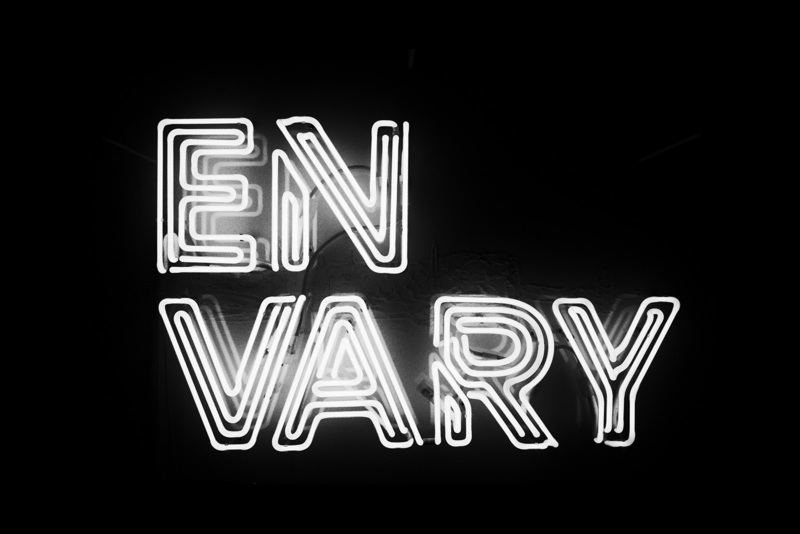 Envary worked with Hong Kong’s renown ‘Nam Wah Neon Sign Manufacturing’ (南華霓虹燈電器廠有限公司) to get a respectable outcome in this challenging project. What we did: After having drafted an ideal version of the Neon sign logo, the design had to get feasible for manufacture. In several iterations the design team aligned with Kam Wah and its 77 year old Sifu Lau Wan (one of the two or three only remaining masters in HK, now retired) optimising the patterns and direction of the parallel tubes as well as adjusting the minimum feasibly bent angles in order to achieve the tightly aligned tube formation. Composed of 2 different colors sections we had to visually split some letters in different tube sections, which added a good chunk of manufacture-inspired character to the design. The Neon sign is hanging in our studio, used when we invited guests and have fun times.